And more besides. But now, journey fifty years into the future! Entitled TH.2058, the artwork – created by French artist Dominique Gonzalez-Foerster – symbolises an apocalyptic vision of London in the future. Set 50 years from now, the installation is inspired by both real and fictional scenarios of the capital under attack. A giant screen overlooks the work, playing extracts from science-fiction and experimental films. Books such as JG Ballard’s The Drowned World and Mike Davis’s Dead Cities have been placed on top of the bed frames, which are illuminated by piercing lights. Visitors are encouraged to stop and rest on the beds, experiencing the refugee camp atmosphere of the vast hall, and the dystopian worlds presented on screen and page. The exhibit is accompanied by the sound of never-ending rainfall – supposedly the environmental catastrophe humanity has sought shelter from inside the gallery. 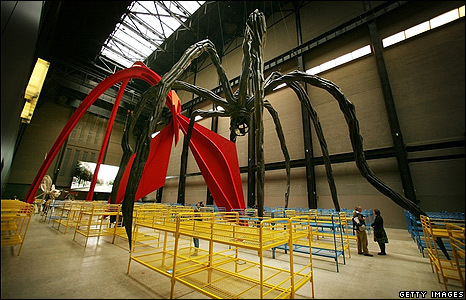 I’ve never been to the Tate Modern before. Should I go and see this, then? Well, I tend to really like the Turbine Hall installations. But it probably depends what you want from your art. But it probably depends what you want from your art. I have to confess, it’s only this year that I’ve discovered there might actually be something worthwhile in this art lark, so I think it’s fair to say that I’m still in the process of working out what I want from it. The only thing I know for sure is that I should perhaps get out and experience it more (and, for a change, not go all the way to New York to do so). Looks to me like an invader from Planet Caro 97425 is about to slice up an interloper from Bourgeois 3, all in one of our capital’s popular tourist attractions. They could get a film out of this: though probably not a very exciting one. Would have to be comprised of inventively used stills– like La Jetee, perhaps.